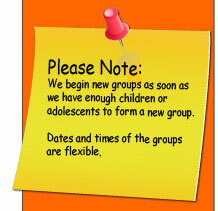 The Social Skills Groups Yes, the children are back to school. In order to have a good year in school, parents simply need to notice their children. It is not even necessary to praise them, just notice them. If you notice when they do something "right" and tell them you notice, they will do more "right". They just want your unconditional love and attention. It is really important to catch children "being good" vs. "being bad". It is easy to catch children who are misbehaving and disrupting, and give them attention for their negative behaviors. But, it is more important to reinforce positive constructive behaviors in them. This approach creates success in children. Children want our attention. They want other children's attention. We want to purposely energize the good behaviors in them. And we will find that they will want to behave well and study well again and again. It is an interesting idea but, whatever we give our attention to, we tend to get more of, including behaviors. How do we do this? Say what you see is right in the children's behaviors. "I have noticed the extra effort you are using." "I notice that you are all getting along nicely." "I notice that you are all cooperating. You are being respectful." "I notice that you got to work on your book report right away." We need to be thoughtful when we choose to energize behaviors in children. How we choose to respond to their behaviors is important, and we should be thoughtful. It is not about complimenting the children. It is mainly important that we acknowledge the constructive and positive behaviors they exhibit. What do we do if children do not behave well? "Limit setting" is important. First, and before they act out in the wrong way, we need to set limits and set up the consequences. Consequences at home should be set in place before children have a chance to act poorly. This way we do not punish them or take something away from them, we merely give them the consequence they knew about beforehand. It is fair. It is not about adults having more power then children. It is about adults supporting children's good choices and helping them to rise to the occasion, and to grow and evolve into the wonderful people they are meant to be. What else can we do to help children from not behaving well? Prevention. Have the children create rules. Children decide on the rules and rights that are important to them. Parents you need to decide on the responsibilities that are important. So remember only make a fuss about the positive and constructive behavior choices children choose. Give more attention to the positive, and you will see how your noticing the good stuff, will produce more good stuff. In addition, how we talk to our children also yields good or bad behaviors and attitudes. Here is an example of how we should and should not talk to our children. You will get more good behavior and positive results if you use the latter: "If you do not do your homework every night this week, you will be grounded on the weekend." Instead, please tell them, and in a supportive way, "If you do your homework every night this week, you will have no homework on the weekend." Or, "If you do your homework every night this week, you will do well in the class and that feels really good". We are not here to threaten our children, only to support them.